NEW in the Steve Smith Store! Steve Smith's band, whose lineage goes back more than 30 years, has released it's burning new album, "Heart of the City." Get it NOW in the Steve Smith Store! The album features 12 tunes performed by six amazing musicians: Baron Browne (bass and vocals), Mark Soskin (piano and Rhodes), Vinny Valentino (guitar), Andy Fusco (alto sax), and George Brooks (tenor and alto saxes). All copies are signed and will be shipped immediately! Save 10% on each product when you purchase two or more titles! Go here to order! Also available in the iTunes store! Three great titles have been reduced to just $10! They include Vitalization (Vital Information) and parts 1 and 2 from Steve Smith's Jazz Legacy. Go here to find Vitalization, and go here to find titles from Steve Smith's Jazz Legacy! Remember, you also get a 10% discount when you purchase two ore more products in the Steve Smith Store! Steve has partnered with PlayAlongJazz to offer several of his music projects minus drums so that you can play along! 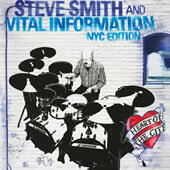 This includes Vital Information albums Heart of the City, Viewpoint, and Vitalization, plus Groove: Blue and many more! Click here to browse what is available! Steve offers a wide array of instructional books and DVDs. 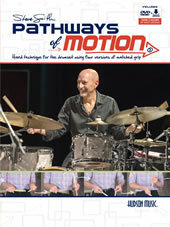 Steve's Pathways of Motion book and Fabric of Rhythm book/LP are recent additions! Pathways explores Steve's current use of matched-grip technique utilizing text and video. It's a great resource for any drummer looking to develop and maintain the grip using efficient technique. The Fabric of Rhythm is Steve's beautiful hard bound book that features his drum art collection, a biography, and much more. It comes with an LP (and download code) that features 14 highly expressive drum solos based on the concepts behind each art piece! 10% off When You Purchase Two or More Items! The Steve Smith Store is currently offering 10% off your entire order when you purchase two or more products (applies to products sold directly from this site). The discount will be applied automatically during checkout! And we've recently reduced prices on all DVDs and CDs! We Sell Hudson Digital On Demand Downloads! Many of our DVD products are now available as Hudson Digital On Demand downloads. This means you can instantly download select Hudson products to your computer! Just look for the Hudson Digital On Demand logo below products on our DVD page! If you don't already have the Hudson Digital On Demand player on your computer, the Hudson links will take you to a page with download instructions and more information. Once you have the player, you can shop for products from other artists, as well! All sales are final. The Steve Smith Store will replace any defective or damaged products. All domestic orders are shipped first-class. International orders are shipped by International Priority Mail. Thanks so much for supporting Steve Smith and independent music! for specific kinds of products.